Sixteen comics into this month’s DC Comics New 52 relaunch we’ve seen stories that push the envelope in terms of content and storytelling (Animal Man) and stories that put fascinating new spins on old characters (Action Comics #1). We’ve seen books with good art (Batgirl) and books with experimental art styles (Animal Man again, and to a lesser extent OMAC). What we haven’t seen is a book that matches good storytelling with innovative, medium-pushing art that also happens to be utterly gorgeous. Until Batwoman #1, that is. Artist J. H. Williams III brings some of the most innovative and narrative-enhancing panel structures to his comics than I’ve seen since the lost, lamented early 2000s series Chase. Which happened to feature art by J. H. Williams III. Williams manages to fit 8 two-page spread compositions in 22 pages of story. The larger canvas lets him show off his great scene blocking, anatomy, and attention to detail. Better yet, panel and word balloon placement work together to form genuinely organic conversations that flow easily from one panel to the next. The book is a joy to look at. Fotunately, it’s also a joy to read. Williams and Blackman’s script pits Batwoman against a supernatural menace called La Llorona (the “Weeping Woman”) that appears to be the ghost of a drowned woman. The ephemeral tripartite creature (maiden, crone, and skeleton) abducts children, sometimes in front of their parents, because she “needs them” for unspecified purposes. The parents are held at bay, feeling as though they are drowning. The captions on the first three pages narrate just such an abduction, as Williams paints the haunted scene in hues of blues and white. The effect of flipping from the two-page spread of pages 2-3 to Batwoman crashing through the window to help on page 4 explodes with a sense of motion, fueled by the contrast of her stark black and bright red costume against the subdued look of the comic so far. There’s also some nice early moments of a budding romantic relationship between civilian Batwoman (Kate Kane) and Gotham City Detective Sawyer, some backstory with a sidekick character formerly named Flamebird that I didn’t quite understand, and an obligatory scene with the actual Batman at the end of the comic. I think I spotted Wolverine and Ghost Rider hanging out behind his cape, so when the Punisher finally arrives they can finally play Rock Band. Best of all, Williams treats us to a great two-page spread featuring Agent Cameron Chase of the aforementioned late-lamented (by me) Chase series. Her boss at the Department of Extranormal Operations, a suit-wearing skeleton named Mr. Bones, wants her to go to Gotham to discover the secret identity of Batwoman. The inclusion of Chase and Bones would have gotten this to the top of my pull list. J. H. Williams is even better than I remembered him, and by far the most accomplished artist of the New 52 so far. 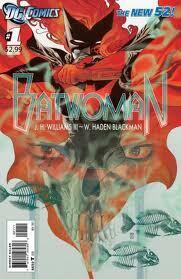 I’ve never read a Batwoman comic before, but this book was absolutely awesome and I think I am in for the long haul. I just read this again. The full 2-page spreads were.. amazing? I was drawn into the story by the structure alone. Good stuff. A keeper for sure. Flamebird is an off again, on again member of the Teen Titans. She is also based on the original Flamebird who was the sidekick of the Golden Age Batwoman.